"Why I think David D. is the best"
This my review for David D.'s "Mastery Program", adapted. See below for "Double Your Dating" section. Okay, maybe "best" isn't quite the right word. To me it's the bedrock on which "technique-heavy" stuff must sit. What he teaches is congruent with Mystery, Savoy, etc., but addresses core fundamentals that, to me, MUST be learned before the Mystery Method or Magic Bullets will work to begin with. Now, this may NOT be true of ALL people. If you're already a confident, SOCIABLE person, who has success in other areas of your life but is only experiencing problems when faced with a woman, or who has certain success dating already but want to IMPROVE your game, The Mystery Method or Magic Bullets, may in fact be all you need. But if you're someone like me, who's good having conversations with women but has other issues (overly sensitive; SO nice to women they disregard you for reasons you find baffling, but don't want to become a jerk), DeAngelo is where you should start. It will also help areas of your life NOT related to women. After a breakup from a 4-year relationship, and being sober for 9 years, I found I'd lost the "bad boy" energy that used to bring me success with women. My program of sobriety stresses service and lack of resentment, which have served me very well in having a wonderful, productive life, but REALLY hurt my ability to interact with women. I desperately needed a way to redraw my boundaries with people (women especially, obviously) in a way that was true to myself, true to my ideals, and yet didn't leave me hopelessly wussed-out. I started with books by Logan Edwards (The A Game), which sounded GREAT on paper, but somehow didn't get me "feeling" the concepts, just thinking, "oh yeah, this is how I SHOULD feel." Got the Mystery "Revelation" DVD / CD set, which gave me a bunch more attitude tips and helped reinforce many of the concept in The Mystery Method. Yet, I STILL found myself placating, being overly nice, speaking too fast "in field," and BOMBING with women. For the value, this can't be beat. 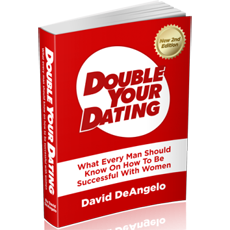 I thought "Double Your Dating" was such a vague / lame title, I put off buying this until after I'd read The Mystery Method, seen Revelation, etc. I'm SO, SO happy I finally got this, because all the techniques in the world couldn't help me without the "core beliefs" down. As soon as I read this, I breathed a BIG sigh of relief. It was like, "YES, FINALLY I understand." Not what to THINK, but what to FEEL. It's hard to describe. I can't speak any more highly about this product. It's the piece of the of the puzzle I was desperately needing, and I already feel the difference. THANK YOU David D., you are a good man. The lower editor reviews here do poor service to this product, but I suspect it's because they already KNOW these core concepts. If you DON'T have these concepts ingrained, in my experience the other techniques will be of limited value, or take much longer to implement. It's one thing to give a man fishing tips but leave him in a shallow pond; it's quite another to lead a man to an ocean of INNER abundance and then say: "Now fish." One more time, David D., if you ever read this: THANK YOU!